Every fall, scores of alumni flock back to campus with their families to reconnect with former classmates and welcome the first-years. 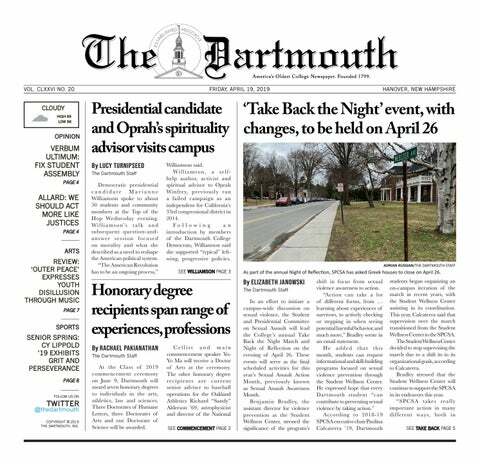 This weekend-long tradition begins with festivities on Friday night, highlighted by Dartmouth Night, the bonfire and the football game. The festivities and the football game were connected in 1923, and over the years, Homecoming has also become a celebration of Dartmouth athletics. The event now features a parade of alumni and athletic teams, as well as the Wearers of the Green ceremony, which honors students, alumni and coaches for their athletic achievements while representing the Big Green. Although football was the first sport at Dartmouth to enamor the entire student body, it was not the first sport to develop at Dartmouth. From the College’s earliest days, administrators expressed the desire for students to maintain their health by exercising. However, while they initially intended for students to vest their time in manual labor such as gardening, students occupied their times swimming, skating and playing cricket. Today, the Dartmouth swim team competes as a Division I sport and has expanded to include diving as well. While skating and cricket have remained club sports on campus, they still have an active student population. In addition, the figure skating team has been named six-time intercollegiate champions. When football first came to Dartmouth in 1867, there was no structure in college athletics, so contests occurred between two teams comprised entirely of Dartmouth students as part of the “Whole Division.” These games pitted seniors and sophomores against juniors and freshmen as well as teams fielded by the Social Friends and United Fraters societies. These games among students culminated in a match known as the Usual Football Rush, which remained an annual Dartmouth tradition until 1948. In its early years, Dartmouth football’s seasons were truncated with no more than five games played beginning in October and lasting through November. However, Big Green football was formally established in the fall of 1881 when it held its first intercollegiate game against the Amherst College on Nov. 16. Captained by Clarence Howland of the Class of 1884, the team defeated the now-Mammoths in a 1-0 contest at home. The game was one of only two played that first year, the other against Amherst once more at a neutral site in Springfield, Massachusetts that ended in a scoreless tie due to snow. During the first 11 seasons in Dartmouth football history, the team was led by team captains, as the title of football coach was not established until Wallace Moyle took the position in 1893. The Big Green began to pick up momentum however in the beginnings of the 1900s as the team fell under the leadership of head coach Walter McCornack of the Class of 1897, who led the team in its first winning season in 1901, where Dartmouth finished with a record of 9-1 leaving six competitors scoreless. Dartmouth held its first intercollegiate football game in the fall of 1881, while the first celebratory bonfire occurred just seven years later in 1888 — although the College did not officially endorse the bonfire until 1895 with the first Dartmouth Night, a celebration of Dartmouth alumni. In 1923, Dartmouth finally united the annual bonfire and ceremony with a football game, featuring the dedication of Memorial Field 30 minutes before the start of the game against Cornell University. Dartmouth Night remained the official title until about 1961, when The Dartmouth referred to it as Homecoming for the first time. Although the bonfire and other ceremonies are a major part of what makes Homecoming special, football has long been the star of the show. In 1980, the Homecoming parade featured multiple floats dedicated solely to football victories—from the 1925 national championship to an undefeated season in 1962 to a 1970 victory over Yale. In 1955, Bob Blackman joined the ranks of Dartmouth football coaches, beginning a historic 16-year tenure. He led the Big Green to seven Ivy League Championships, including three undefeated seasons in 1962, 1965 and 1970. Typically competing against Ivy League rivals Brown University and the University of Pennsylvania, Blackman saw the team to 10 straight Homecoming victories as part of an overall record of 12-2-2 in Homecoming games. In these contests, Dartmouth left seven teams scoreless. The Blackman era saw star players like Bob Mlakar ’70, John Short ’71, Clark Beier ’70 and Bob Lundquist ’69 consistently lead the team in rushing and touchdowns. Short was also a member of the Dartmouth’s undefeated 1970 team, Blackman’s final year of coaching. On game day, hundreds of green-clad supporters poured into the stands ready to yell themselves hoarse in support of the Big Green. At this year’s Homecoming, the Big Green fans watched a nail-biter of a game: At the start of the fourth quarter, Dartmouth was down 13 points to Yale University. In the last six minutes, however, the Big Green scored two touchdowns to piece together a thrilling 28-27 victory over the Bulldogs. Some years, as with this season, Dartmouth scores an exciting victory on their home turf; other years, they’re not quite as successful. Regardless of the outcome, the Homecoming game has a strong sense of history associated with it. What makes Homecoming special is storming the stands with your best friends, clapping and cheering alongside over 50 years’ worth of Dartmouth students. Win or lose, the whole event brings a sense of unity that feels like coming home.